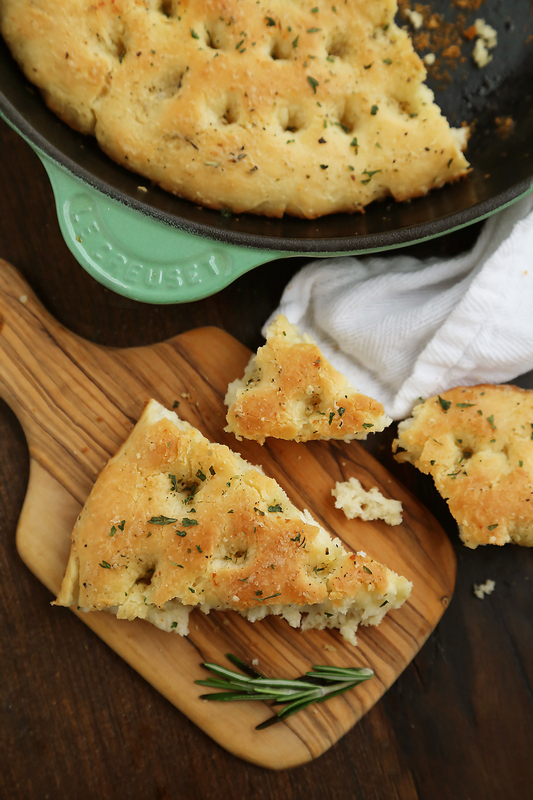 This quick, easy homemade focaccia bread turns out soft and fluffy in your skillet, every time! Perfect for the side of hearty vegetable dishes, soups, stews and saucy roasts. 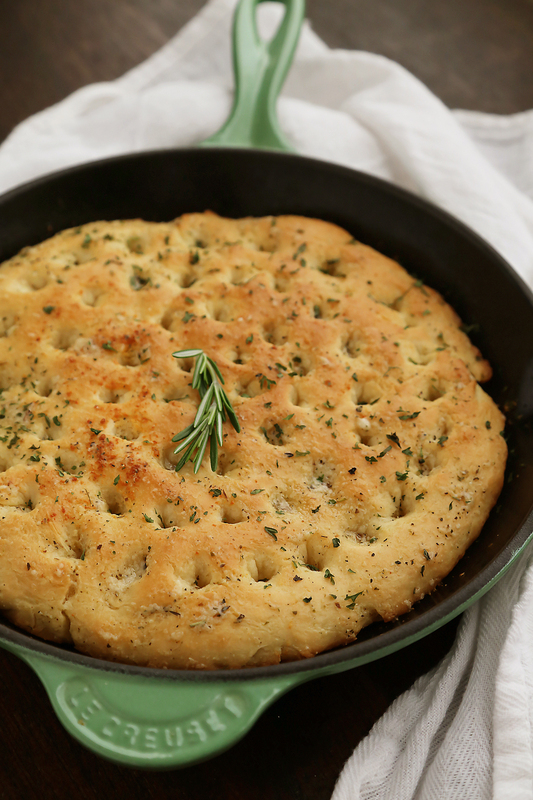 When it comes to yeast breads, there are few easier to make than focaccia. This beautiful flat bread comes together easily with the usual cast of characters – flour, water, salt and yeast – with a pinch of sugar and drizzle of olive oil for an extra bit of goodness. You can really taste the olive oil in every mouthwatering morsel, however that doesn’t mean this bread doesn’t deserve a good dipping oil. My favorite combination for dipping this bread lies in a little bowl of olive oil, grated Parmesan, crushed red pepper flakes, oregano and a pinch of salt. Certifiably yum. 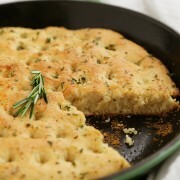 Not only is focaccia a great starter bread, since it is relatively light in consistency, but it makes the perfect sponge for mopping up a saucy stew, hearty roast or hot soup. Warm out of the oven, this bread will thaw the chilliest winter bones. Since this quick and easy focaccia only requires one 30-minute rise, I like to make sure to use the best possible yeast for the job. 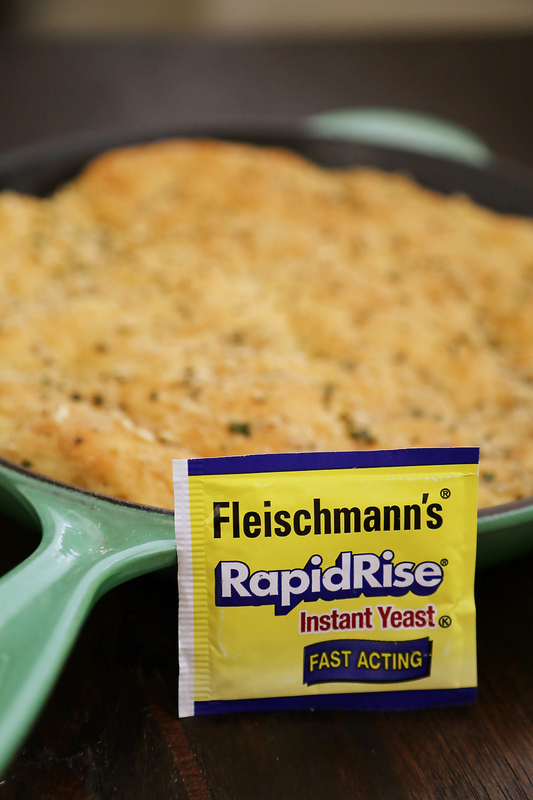 In my kitchen, you’ll never find any other than Fleischmann’s® RapidRise™ Yeast, which has been my longtime favorite for irresistibly tender, fluffy baked breads, soft pretzels, cinnamon rolls, dinner rolls and much more. I used to be afraid of working with yeast, but I fear no more since discovering Fleischmann’s. It’s just the best! 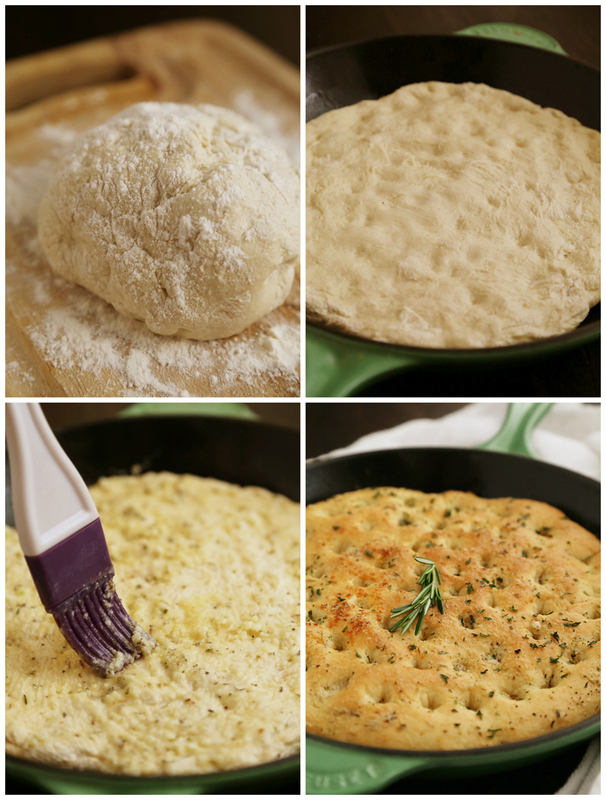 Especially if you have never used yeast, focaccia is an easy first introduction. It is so simple to make, and practically foolproof with the right, fresh ingredients. It pairs perfectly with any hearty winter meal, or serve it on the side of a salad, or as a thicker sandwich bread. 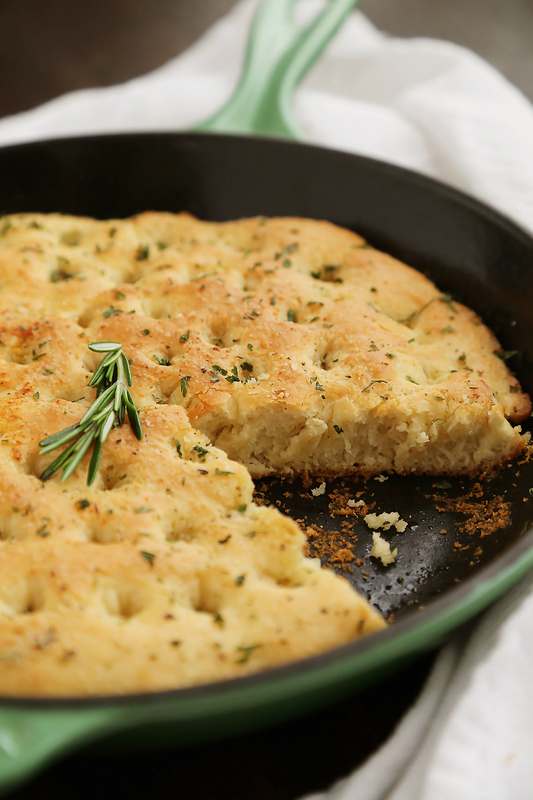 I know you will love your results with this one-hour skillet bread recipe. However, if you don’t have a skillet, feel free to use a different baking pan with similar dimensions. Preheat oven to 250 degrees. Once preheated, turn off. (This creates a warm space for rising the dough.) 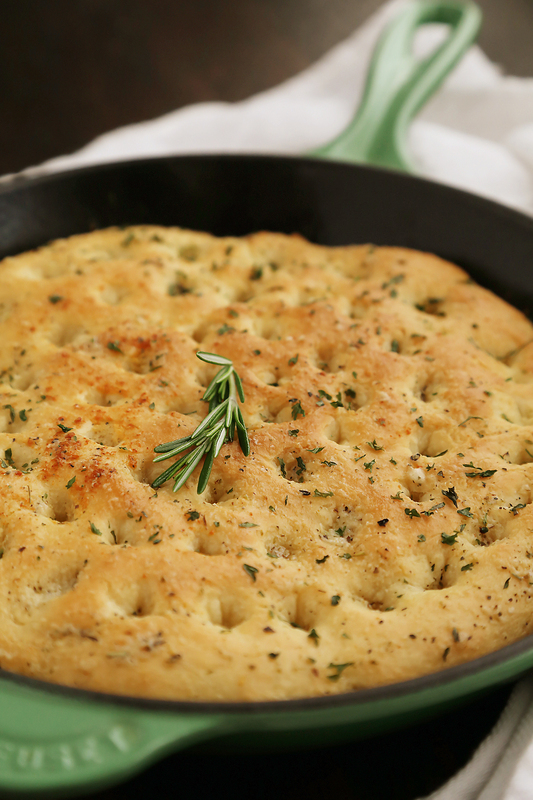 Brush a 10-inch skillet with 1 teaspoon olive oil. In a large bowl, combine water and sugar. Stir until sugar dissolves. Stir in yeast and let sit for 5 minutes. Stir in salt and 1 cup of flour until well blended. Add 2 Tbsp. olive oil and mix well. Gradually add remaining 3/4 cups flour. Mix until dough pulls away from the sides of the bowl. Place dough onto a floured surface and shape into a ball. With your fingers, press into the oiled skillet, covering all sides. Cover with a dry kitchen towel and place in turned-off oven for 30 minutes. Remove skillet from oven and preheat to 400 degrees F. Make indentations in the dough with your fingers. Mix melted butter, Parmesan, garlic and seasoning in a small bowl. Brush the dough with half of the butter mixture. Place dough-filled skillet in the preheated oven and bake 20 minutes, or until golden brown. Brush with remaining butter. Let cool slightly, then slice and serve. This is a sponsored post by Fleischmann's Yeast that I am sharing as a Bake a Little Extra Blog Ambassador. I was compensated for my time. However, all opinions are my own. I love focaccia so much but have never made one of my own for some reason. Garlic parmesan sounds perfect! One hour for something this gorgeous? I’m definitely going after this one! SUCH a gorgeous focaccia!!! It looks SO deloicious, too! I’m not crazy about the rapid rise yeast! It doesn’t foam up. I dumped the remainder of the packet into the dry ingredients, and it seemed to rise okay. After following the recipe my dough was very very loose and looked nothing like the picture that you included. Any pointers?